Her first employment after leaving Art College was at Poole Pottery, where she painted the dynamic and boldly coloured designs of the now famous Delphis ware – very collectable and realising high prices at specialist auctions. Delphis range dishes painted by Josephine Wall, 1967-1968, Diameter of centre dish 14″ (35.5cm). 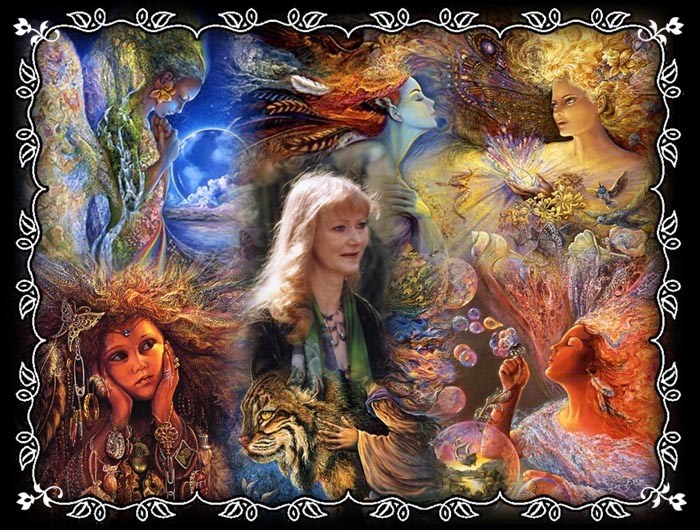 Josephine Wall trained in fine arts at Bournemouth and Poole College of Art. The fascination of this paintress with insects and animals, butterflies in particular, was much in evidence while working at Poole Pottery. In 1968 she modelled, carved and glazed a number of insect and animal figures in a new stoneware body and these were first shown in a London exhibition at the Carlton Towers Hotel and subsequently in a display at Harrods. An African horned chameleon sculptured by this artist was illustrated in the Gift Buyer International, August 1968. 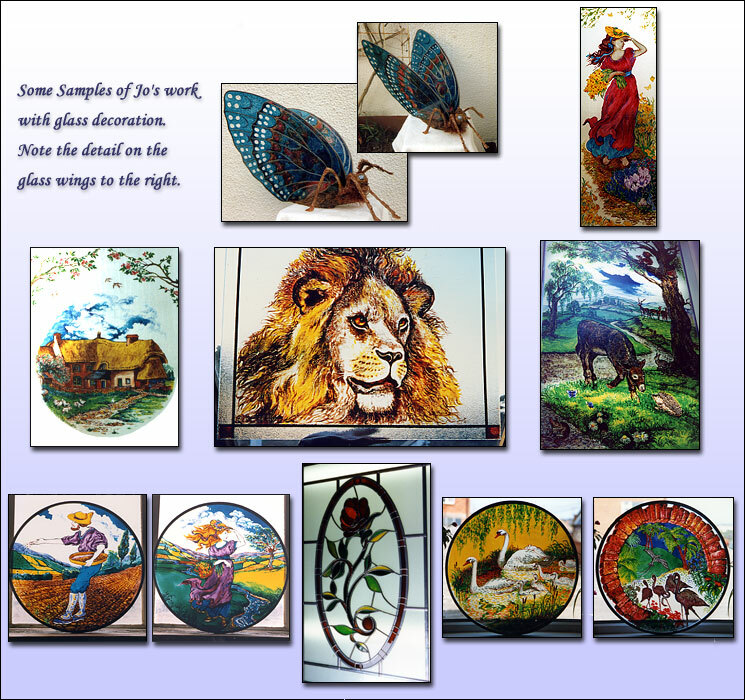 In addition to her main love of painting, she directs her creative energies into pottery figures, sculpture and reproduction stained glass panels. She has even customised items of clothing. She lives contentedly with her husband at Wisteria Cottage’ where she works in a purpose built attic studio. The walls are covered with a huge wisteria, cascading gorgeous flowers – hand painted of course. Josephine is convinced that working under the pyramid shaped roof is a source of inspirational vibes, aiding her creativity! The rest of the cottage also displays her artistic nature, a woodland scene and butterflies in the kitchen, flowers and birds on the furniture and even more wisteria on the glass doors in the living room. Even the garden doesn’t escape her touch, as she likes nothing better than to spend time designing unusual features and creating an abundance of colour, with a slight bias towards a Victorian style. As with most artists Jo is often asked ‘where do you get your ideas?’ the answer is … “from anywhere and everywhere”. Jo is never short of inspiration; in fact she feels it is a race against time to produce all the images that she has conceived. Another often asked question is ‘ how long did it take to learn to paint?’ the answer is … “a lifetime”, because she has painted since she was a child and the work has evolved and matured until the current image was created. Her paintings actually take on average 2 –4 weeks depending on size and subject. More frequently asked questions. Josephine works mostly with acrylic paint, which allows her to paint quickly, and to create many textured and colourful effects. She has been influenced and inspired by the illustrative talents of Arthur Rackham, the surrealism of artists such as Magritte and Salvador Dali, and the romanticism of the Pre-Raphaelites. This combined with her own imaginative ideas has led to a wide and varied range of work. Josephine is also an accomplished sculptor and has created a number of unique figurines. Using natural stone found locally, various modelling materials and semi-precious stones, she creates models that once painted, challenge the viewerButterfly to find where the stone ends and the figure begins. 1967 – Following three years at Bournemouth College studying Fine Art, Josephine worked at Poole Pottery as a designer and painter of Delphis Ware (now very collectable), later modeling animals to be displayed at Harrods in London. Her pottery figures include characters from Tolkien’s “Lord of the Rings” and mythological creatures. Certain pieces of this work now form part of a book on the history of Poole Pottery. 1974 – A number of larger paintings were exhibited in Teheran and Tokyo. 1975 – Held her first solo exhibition in Swindon. 1990 – Following a period during which she brought up her three children whilst still exhibiting both locally and abroad, a second solo exhibition was held at the Mayfield Gallery in Bournemouth. Also during this year, Josephine and her paintings were the subject of a special feature on Southern Television in the UK. 1991 – Held her third solo exhibition at the Mayfield Gallery. 1993 – Following a visit to the Spring Fair in Birmingham she signed contracts with F.J.Warren based in Hitchen, England and Wizard and Genius from Switzerland to publish her work in the form of framing prints, posters and cards. These prints are distributed worldwide. 1995 – Josephine’s painting “Dance of all Seasons” was selected for the cover of W&G’s “Cheerful Joys” catalogue. 1996 – Signed a licensing agreement with Art Impressions based in Los Angeles, California, which has led to many new outlets for Josephine’s images. Many products are now produced including cards, stationery, puzzles, journals, bookplates, back to school products, mugs, needlepoint kits and posters, as well as limited edition prints. 1998 – Five original works were selected for an exhibition at London’s prestigious Mall Gallery entitled “Art of the Imagination”. Josephine has subsequently joined the circle of artists in the society of the same name, with the possibility of many more exhibitions worldwide. Pop Icon Britney Spears requested the use of a number of images for use on her new website www.britneyspears.com. Britney also purchased a number of Limited Edition prints and Josephine created an original painting for her. Met Maggie & Ric Hilton who purchased the Windcliffe Manor on the Isle of Wight, and converted it to a boutique style 5 star B&B, renaming it “The Enchanted Manor” www.enchantedmanor.co.uk and basing the fantasy style décor on Jo’s work. Bought at auction the Manor was featured in the television programme Homes Under the Hammer, and displayed many of Jo’s images. 2008 – In March & April Jo did a tour of Georgia & Florida organised by Dr Pat Sager with exhibitions, book signings, and including the Cherry Blossom Ball in Macon. In addition to a range of Limited Edition Prints, I have licensing agents in California (Art Impressions Inc. www.artimpressionsinc.com) who license my work around the world. They are responsible for finding the contacts and setting up the deals. Apparently there is a rush to see who will get my new images as they appear!! It has been used for greeting cards, calendars, posters, stained glass, craft transfers (“T” shirts), journals, stationery, cheques and cheque covers, mugs, magnets, suncatchers, treasure boxes, wall murals, scrapbook paper sets, fabric squares, figurines, and puzzles.